Ή μπορεί και να κάνει γιόγκα, ποτέ δεν ξέρει κανείς. Adult giraffes do not sleep much. Some scientists estimate they sleep only a half hour to an hour each day in 5-minute naps during the night. During sleep they rest their neck on their hind legs but usually remain standing. Their necks make an arch over their backs. 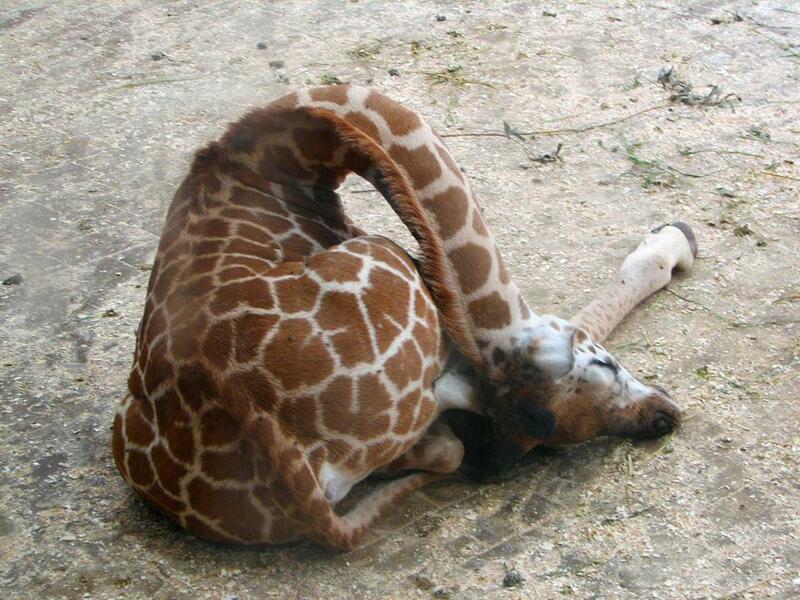 Giraffes can get down to the ground, but it is not easy. Sitting down or standing up from the ground is difficult, as giraffes must sway with their neck and back to keep balance. Though they only sleep for an hour, giraffes may rest with their necks down for longer periods at night. Because their height is a defense against predators. It's smart for giraffes to remain standing.